Professional cookware for the everyday chef. Elite 12-piece set features hard-anodized material and Dupont's Autograph? nonstick surface that provide great, consistent cooking results. Limited lifetime warranty. Handsomely designed with contemporary straight sides, deep charcoal gray exteriors, and shiny stainless trim, Anolon Advanced cookware has another reason it's so sought-after: it cooks beautifully. Constructed of hard-anodized aluminum that's even more durable than stainless steel, the cookware retains and distributes heat efficiently with no hotspots. The cookware is also coated inside and out with DuPont's high-quality, three-layer Autograph nonstick finish to keep food from sticking and scorching. Moreover, Anolon gives the cookware 18/10 stainless-steel handles with cushy silicone rubber grips for a cool, secure grasp. Break-resistant glass lids let you monitor cooking progress without losing flavor or nutrients. All the lids and knobs are oven-safe up to 400 degrees F, so you can start a dish on the stovetop, and finish it in the oven. 12-piece cookware set. The set consists of: 2-quart covered saucepan; 3-quart covered saucepan; 4-quart covered saucepan; 10-quart covered stockpot; 8-inch skillet; 10-inch skillet; 12-inch covered saut�� pan. 12 pieces total. Creates the Desire to Cook!! I bought three sets of this product for my three young adult children. Doing so has resulted in their increased desire to cook, or learn to cook. They have all abandoned their college era cookware and rave about the difference in their culinary experiences with high quality equipment. They mentioned heat retention, pots 'getting hot enough', even distribution of heat, true nonstick surface, and the full line of cookware shapes and sizes. Initially, the discouragement to clean this product in the dishwasher was somewhat of a concern. My children's generation does not fondly look on menial, housework tasks. But I have been assured that clean up is no problem; and they have not been forced to wrestle with the idea of putting it in the dishwasher...anyway. As a result, all three have been experimenting more in the kitchen. And the outcome of that is that all three of them are eating healthier food. This cookware has sprinkled some joy in what was previously deemed a more task oriented activity of 'having to cook'. I'm by no means a great cook, but the difference between cooking with this set of pots and pans and my previous set is unbelievable! They heat evenly when cooking, no more half burned dinners. This was a really great deal! I saw this exact item at Bed Bath and Beyond for $399. Came home and found it on Amazon for $269 with free shipping. Amazing! Love the set. It's a great combination of qualities. The handles are coated so they never get hot. The lids are glass so you can see inside the pots. Non-stick surface, terrific. They are a little heavier than my old set but the big pots have two handles. 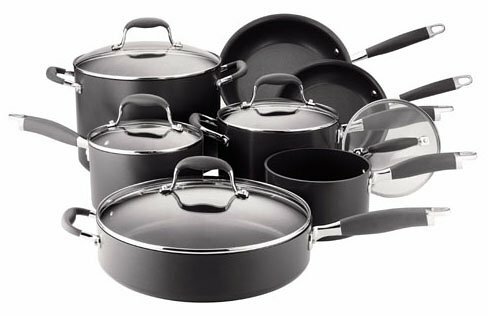 Anolon Advanced 12 Piece Cookware 81959 is the very best!! These have been great pans. I've had a set for over five years now and they still look new. No signs of wear at all. I've religiously used only non-metal utensils with them (wood, silicone, etc). As a result they're still like new. Even with overheating the pan once or twice they're still in perfect condition. And if you want a good addition to the set, get the grill pan. The one that's a regular height, not the shallow one. The regular one does a FANTASTIC job cooking bacon. Likewise it does a fine job grilling everything from chicken to fish and burgers (which are still better outside). I have spent a good amount of money of other cookware including AllClad and the various grades of Calaphon... nothing has held up and is as easy as this cookware, especially for the price. I got two sets on sale from Amazon and gave most of it away as gifts split among my family. They all argued about which person got which pan because they all wanted the complete set... so last year I bought everyone the pieces they were missing including myself and then put all my other pots/pans in the next rummage sale. I've never been happier. Best cookware for chefs of any level! It's hard for me to believe that I've been cooking with inferior cookware for 50 years. This is the best I've ever used and believe me I cook a lot! Sure wish I'd had it to cook with in the past. I got the big sautese pan with the set but didn't think I'd use it much, it has now become my favorite. Just don't over heat them and I'm sure they'll last forever. It does take a while to heat them up as they are very thick but they heat very even too, way beyond the burner size. My wife and I researched cookware sets for over a month. Finally we decided to purchase a more expensive set made by the most renowned name in pots and pans in the $250-$400 price range (I will withold the name of the manufacturer here as it isn't important). After cooking in 3 of their pots and pans the first evening, we returned the set the following day because of the way insides were tarnishing and almost looked like they were rusting. We came here to Amazon and saw the reviews on this set and decided to purchase it from Amazon that night. Over the last 6 weeks, we have enjoyed everything about the Anolon pots and pans including the nonstick surface and the clear covers. An added bonus has been the durability of the finish on the outside, which still looks as good as it did the day we unboxed it all. May sound like a dumn thing to mention, but if you look at most of the other black pots and pans in stores, you will see how easily the display models can be scratched - and usually are very scratched, even though they haven't been used in a kitched yet. Every time we buy some, copper-bottom, stainless steel, non-stick, etc....she finds something to complain about. also we have a gas stovetop that heats in a ring at the outer edge of most pans, so things like chicken breasts and pork chops tend to burn with aluminum pans near the flame while remaining uncooked in the center of the pan. so we got copper-clad stainless steel pans to solve that problem....then the stainless steel warped after a while and was a complete headache to clean up. Also the edges were very thin and the pans got dents in them, etc. then we got another brand of aluminum anodized stainless stell cookware. it was on one of those "ridiculously great" cookware deals that you see all of the time. well the anodize suface started scraping off after about six months and the outside of the pans got a milky-white oxidation residue on them. also the pans were hardly nonstick for an anodized surface. then we tried a teflon coated surface but we had concerns about toxicity (the fumes from a hot teflon pan have been demonstrated to kill pet birds). Also fried chicken breads just looks and taste really odd with a teflon nonstick pan. All white and smooth looking..... very weird. pretty much everything sucked one way or another and almost none of it was as good at pots and pans were in the "old days"
However, I have to say that she *loves* this new analon cookware set. We wish we would have had the foresight to purchase the Anolon titanium series instead as it is dishwasher safe. but these pans and pots are great. Nice and thick, the lids fit well even after banging them around. The chicken breaks and pork chops brown nicely....the cook very evenly, and they are actually nonstick.... pretty amazingly so for anodized aluminum. I don't think you can go wrong with this set. Don't make the same mistakes I did and end up buying a half dozen other sets first. The handles are comfy and easy to grip, and the larges ones have double handles for lifting heavy items. great stuff all around. can't say enough good things about these!!!! Those are great quality cookware. I use them on a daily basis and could not be happier with them. What I appreciate the most is that nothing sticks to the bottom of these, no even boiling milk. In the past, I'v used caphalone, but heating milk on a stove always follows tough cleaning of the pot afterwards. With these, the burned milk on the bottom simply lifts off as one piece with a rinse of water. If you are still reading all the reviews and can't decide BUY IT! We purchased this cookware about 3 months ago and use it on a gas stove. For the price ($190) this is by far the best set my wife and I have used. Even at $400 this would be a value. The set is so easy to clean - inside and out - and she thinks that the food actually tastes better coming out of these pans than the last set we had (C.E. from QVC). The only thing my wife did not like about this set is that it didn't come with a small sauce pan, but we remedied that by buying the butter warmer and the 1.5 qt sauce pans at LNT. Nice heavy duty pots and pans. The non stick is amazing both inside and out. It practically cleans itself! I was a little apprehensive about not being able to pop in the dishwasher, but it hasn't been a problem at all. I have even left the pans for two days before washing. Just soaked for a few minutes in hot water and wiped clean as a whistle. The 12 piece is a nice starter set that I am still adding to. I bought the now discontinued pasta pot, 14" open fry (which works wonderful as a stir fry-just use my large pizza pan as a lid), the mini au gratins and received the 5 quart casserole as a free gift. My next purchase will be the 18x10 griddle to replace the piece of junk I received when I bought my new glass top stove. The selling points for me were the clear glass lids to be able to see what's in the pot, and the rubber grips on the pan handles and lids. I don't like burning my fingers because I always forget to grap a pot holder first. They are oven safe to 375 and I usually don't cook too much over that temp any way.